In preparation for St. Nicholas Day, I read the girls books about St. Nicholas and the impact he made on people during his time. 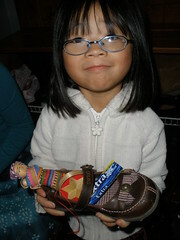 They learn about the tradition of St. Nicholas Day around the world. By December 5th, they are eager for a visit from St. Nicholas. On the evening of December 5th, the girls place their shoes in the mudroom. They need assurance that the outside door will be unlocked so St. Nicholas can get inside and fill their shoes. They go to bed and try to fall asleep right away so St. Nicholas doesn’t pass by the house. In the morning on December 6th, they eagerly go to the mudroom to see what was left in their shoes. 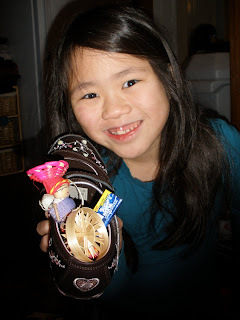 This year, St. Nicholas brought them a tiny doll, an ornament from Slovakia, and a pack of gum since each of them love to chew gum (helps with sensory issues since both have sensory integration dysfunction). They were little gifts…but the girls were so excited. It’s something they look forward to…a simple tradition that they can count on and remember throughout the year.